In stock -This product will ship today if ordered within the next 4 hours and 10 minutes. This perfume-free power liquid cuts through grease and burnt-on stains effortlessly, and because it’s concentrated, a little goes a long way. It’s 100% hypoallergenic too, making it suitable for those with sensitive skin and strong allergies. Above 30% Anionic Surfactant. Below 5%: Nonionic Surfactant, Sodium Chloride, Citric Acid. Use sparingly! 10-15ml (two teaspoons) should be sufficient for an average bowl of washing up. 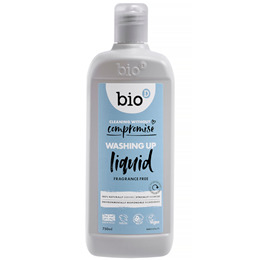 Below are reviews of Bio D Washing Up Liquid - 750ml by bodykind customers. If you have tried this product we'd love to hear what you think so please leave a review. Like product but cups do get tea/coffee stained and doesn't remove grease as well as leading brands. Great product without "chemical smells", long lasting and good value. 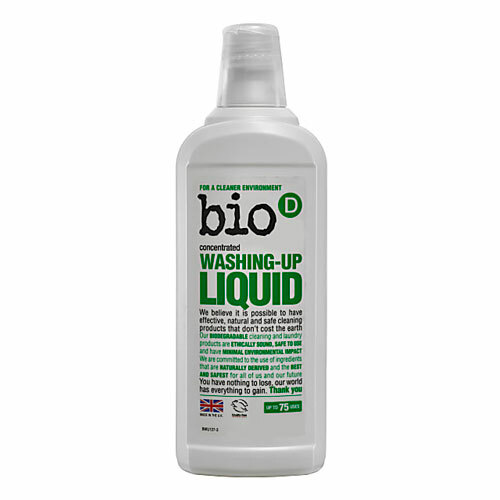 Bio D Washing Up Liquid is a very good product that is efficient, economical and lasts a long time. It is extremely kind to the hands, while at the same time leaving dishes, etc., clean and fresh smelling without chemicals. I never use anything else.